The security guard kept restraining Pedro even after he lost consciousness. Image Screenshot of video by unidentified author, widely broadcasted in Brazil. Uploaded by Poder360. 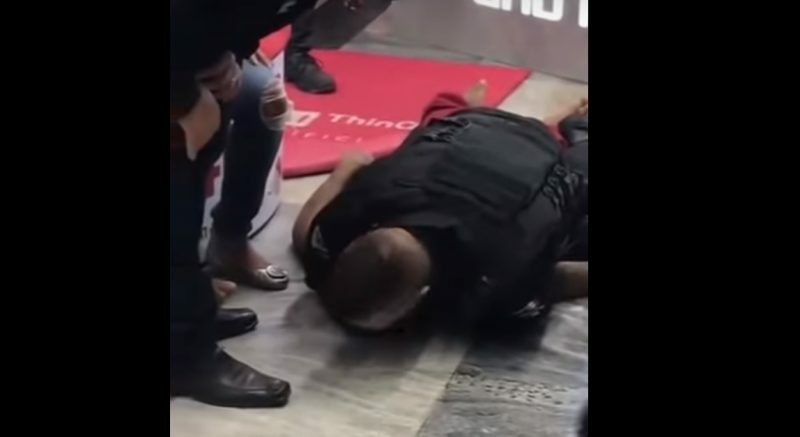 On the two-minute-long video widely shared online, it is possible to see 19-year-old Pedro Henrique Gonzaga face down on the floor of a supermarket store in Rio de Janeiro, Brazil, both hands lying motionless beside him while security guard Davi Amâncio lies on top of him, grabbing him by the neck. It was a Thursday, February 14. Pedro was taken to a hospital and was pronounced dead by cardiac arrest less than an hour later. The store’s management released a note stating Pedro had tried to steal Amâncio gun. CCTV footage shows Pedro talking to him and falling to the ground twice before he was restrained. Amâncio was arrested on the spot, but was released on bail soon after. He hasn’t yet been charged with a crime. The police chief who’s investigating the case told the press that the Amâncio “overreacted in self-defense”. Pedro’s relatives, who were at the store when he was killed, told the police they were on the way to take Pedro to a rehabilitation clinic for drug addiction and had stopped by to buy supplies. The death of an unarmed young black man at the hands of a security officer has hit close to home for a lot of people in Brazil. A third of the 60,000 homicides registered every year in the South American country are of black males below the age of 20. Every 23 minutes, a black man is killed. Many grow up accustomed to being mistaken for a criminal by the authorities or society at large. Activist Rene Silva remembered past cases of murdered black children and teenagers who subsequently were portrayed as criminals on social media. Eduardo de Jesus, 10, was fatally shot in April 2015 by a police officer, who wasn’t charged. Investigators concluded he acted in self-defense, reacting to gunfire coming from an unidentified shooter — which contradicts the accounts by eye-witnesses who say there was no gunfire. Maria Eduarda da Conceição, 13, was killed by three gunshots in March 2017 at her schoolyard during a shootout between the police and drug gang members. A police officer was charged with murder. On a Twitter thread, singer MC Carol recounted her early experiences of racism. After winning a contest at school, she was awarded the role of the “bride” at the nativity of Saint John, a traditional celebration in Brazil, but was rejected by her pair, a white boy who she says didn’t want to dance with her. Carol said she grew up fearing white people. Three days after Pedro’s murder, protests erupted in five major cities around Brazil with the banner “vidas negras importam”, a direct translation in Portuguese of “black lives matter”, a movement born in the United States in 2014 that has gained traction in recent years in Brazil.